Anti-government protestors at the Ministry of Finance in Bangkok. 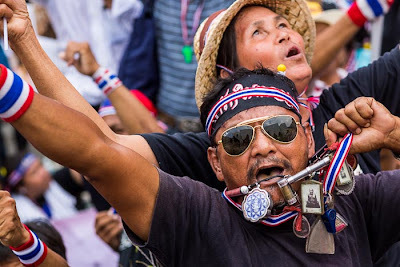 I didn't come to Thailand to photograph politics. But I'm a journalist and I have to go where the news is. And right now the news in Thailand is the anti-government protests that are taking place in Bangkok. 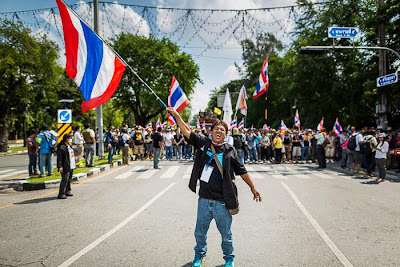 Monday, protestors left their protest site at Democracy Monument and took over the Ministry of Finance, where Thailand's financial decisions are made. It would be like protestors in the US taking over the Department of the Treasury. Former Deputy Prime Minister Suthep Thaugsuban, leader of the protests gridlocking Bangkok, walks through the crowd at the Ministry of Finance. It's impossible to explain these protests to people who don't follow Thai politics. 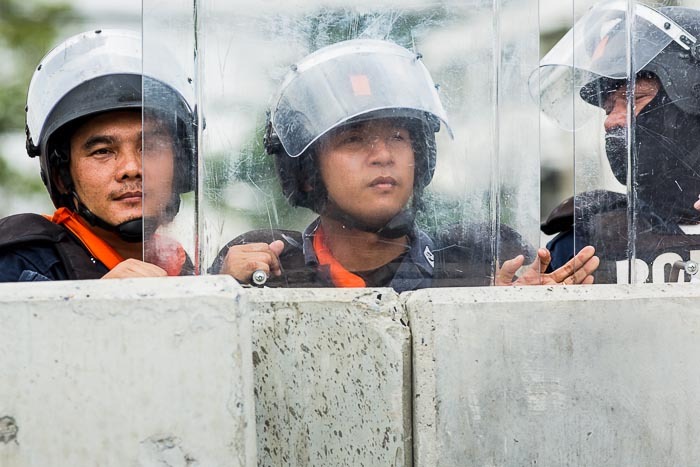 Thomas Fuller, the New York Times reporter in Bangkok, has a good story about the protests in today's Times. He explains it much better than I can. I can say there is a certain element of deja vu all over again in covering these protests. I seem to spend hours listening to speeches and photographing people cheering their respective leaders all the while wondering how it's going to end. Will it end in bloodshed like 2010? No one wants that. Will it end when protestors close the airports like 2008? (The current protestors are allied with the people who closed the airports in 2008.) That would be an economic disaster and no one wants that. 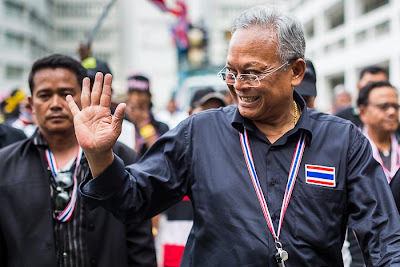 Will it end when Red Shirts (who support the current government) come to Bangkok to defend the government from the protestors because the police and military haven't done anything? That, to me, is the worst case scenario. Red Shirts have been gathering in a large sports stadium in suburban Bangkok. So far they've stayed in the stadium listening to speeches and vowing nonviolence but it's not impossible to see them saying enough is enough and taking to the streets. Top picture: an anti-government protestor screams at riot police (bottom picture) who are stationed behind concrete barricades fronted by razor wire. What puzzles a lot of foreigners is that the protestors have occupied the government buildings by just showing up. They announce their plans, jump in their trucks and motorcade off to the building they intend to close. When they get there, they blow some whistles and march into the compound. There has been absolutely no violence and very little property damage (not even broken windows). The protestors have, really, been quite well behaved. At the same time, there has been absolutely no police presence around the government buildings (except for the Prime Minister's office and Parliament, which are very tightly guarded). There has been no effort to stop or control the protestors. I can't imagine this happening anywhere else in the world. Certainly not in any country in this neighborhood. There are more photos of yesterday's protest in my archive or available from ZUMA Press.